The town of Axminster saw no carpets made for about 100 years after the closure of the original manufactory, although its name remained synonymous with carpets worldwide. An enterprising young man whose father was steeped in the carpet industry in Kidderminster happened to stumble over this fact and, with encouragement from local Axminster worthies, the renaissance of carpet making in Axminster took place. The founding of the modern manufactory took place in the dining room of Castle Mount, Axminster, in 1937 with a capital of £15,000 and the goodwill of some local businessmen. The first carpet to be made in Axminster for 102 years was produced in May 1937 and went on show in a local shop window. The new enterprise was successful and, just prior to the Second World War, twelve narrow looms were in operation. However, with the onset of hostilities these looms were mothballed and the factory turned out stirrup pumps and aircraft engine parts instead. Axminster. It is now one of the most modern plants in the country. Meanwhile modern broadlooms were installed in the carpet factory and orders flowed into the home of carpets. ‘Axminsters from Axminster’ became the mantra for quality and consistency in supply. In an effort to extend the supply chain from fleece to floor, Harry became involved with the breeding of Drysdale sheep in New Zealand and, in the late 1960s, imported 30 ewes and two rams as the nucleus of a new flock. From a commercial point of view, the small quantities of wool produced never satisfied the carpet looms, as in the UK the farmer makes his profit from the carcass, not the clip. The word of Harry Dutfield was his bond and the ‘guvnor’, as he was affection- ately known, made carpets for palaces, castles and country houses, just like his predecessor Thomas Whitty. 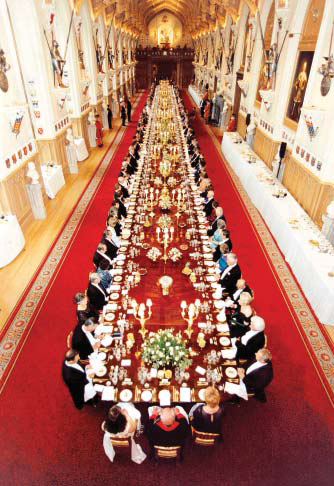 After the fire at Windsor Castle the new carpets came from Axminster. Osborne House has also been graced by a modern Axminster and the circular Royal Albert Hall provided a particular challenge which was success- fully completed in 1999. Harry died in 1991 but he had handed on the baton to his son Simon, who has continued the development of this friendly family firm. This year, Harry’s grandson Josh joined Simon as joint managing director, and so the warp and weft continues for those magic Axminsters from Axminster. 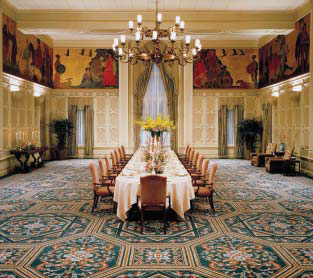 Carpet design has not changed dramatically from the days of Whitty; just the tools that produce the design. Until 1990, carpet designs were still being drawn in charcoal then transferred to point paper with the squares then painted by hand. The advent of comput- ers enabled designers to draw and produce designs five times faster than using the traditional method, as changes in colour and layout could be made with the click of a mouse and approved by the client electronically. However the designer still needs inspiration from Persian and Turkey carpets, architects and the world of nature. Computers have helped Axminster Carpets Ltd to produce large patterns that were not previously imaginable. 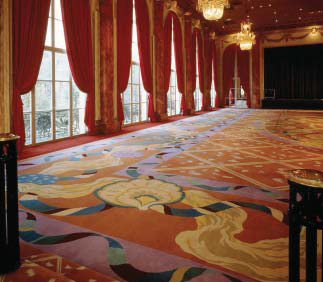 The curved borders for the Royal Albert Hall, a 36×121 ft rug simulating water for a European Hotel and many reproductions of historic carpets for the National Trust and English Heritage, have been made possible by the use of computers. The tools in a digital age have changed but the craftsman’s art reigns supreme. No doubt Whitty would agree that drawing a design is easy; the real challenge is to produce one that lasts.